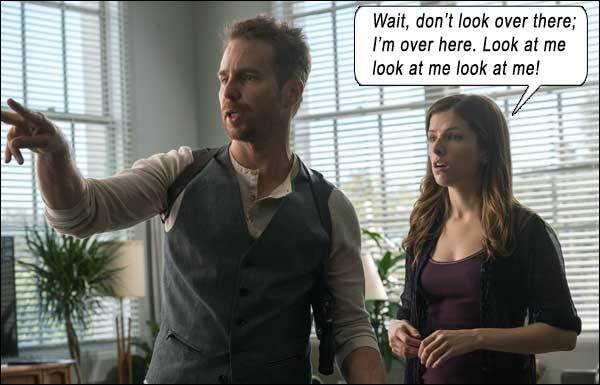 Anna Kendrick overacts and Sam Rockwell tae-kwon-dances his way through MR. RIGHT, a breezy black comedy about a lonely girl (Kendrick) who falls for a hitman (Rockwell) who has turned over a new leaf and is on a mission to whack every person who hires him for a job rather than the target. After an unconvincing breakup scene with her previous boyfriend, Martha (Kendrick) meets mysterious stranger Francis (Rockwell) who sweeps her off her feet. They have such a powerful connection that when Martha discovers he is a hitman, Francis promises her he would stop killing for her (only wounding the scores of hitmen that come after him from various cartels for reneging on jobs). Tim Roth, who is great in anything, is a former hitman colleague of Francis’s, simply out to “rescue” Francis from the new “moral principles” he has embraced. James Ransome and Michael Eklund are two gangsters who kidnap Martha to bait Francis, but we realize they’re stupid when they tie her up and then never take the opportunity to rub their faces over her smooth swells. RZA is a gangster working for Ransome, who is abused so much he turns to the side of Francis. Rockwell is superb, in another role that showcases his devil-may-care acting ability, as he dons a clown-nose to go into action and literally dance through hand-to-hand combat against foes (an interesting device and character trait for a hitman), and Kendrick overdoes the cuteness by a factor of ten Hello Kittys, which is the standout problem that ruins this otherwise enjoyable diversion. She’s already the cutest thing on Earth, with that jutting jaw, flawless face and high tight chest – why is she trying to climb the Everest of cutiepie with all that pouting and sassy affectation? Her “indicating” attempts at comedic inner-voice dialogue shatter our suspension of disbelief, and we feel like we’re watching someone auditioning for a madcap comedy. And blowing the audition. Please don’t make this any hotter or I’ll have to take my pants off. Yes, the gangsters are stock bad guys who can’t aim, with the boss (Anson Mount) taking up the screentime that B-List Superstar Eric Roberts has left behind; and Martha’s roommate (Katie Nehra) is a ditzy blond that doesn’t approve of Martha’s choice of lover; and Martha is treated as an object by the script, with seemingly no job and no goals except the immediate one of assuaging her yearning loins after a breakup. Martha also seems to have some kind of innate combat ability, which Francis brings out in her, not through any training, but simply because he tells her she has the ability, and suddenly she can catch knives and beat hired killers to death. What I’m saying is, there are lots of stumbling blocks that MR. RIGHT has to overcome to suspend our disbelief, so Kendrick’s unsuitable Woody Allen-lite isn’t helping any. Written by Max Landis and directed by up-and-comer Paco Cabezas, the artlessly named MR. RIGHT might have been more in line with its malfunction had it been named MS. WRONG. Starring: Sam Rockwell, Anna Kendrick, Tim Roth, James Ransone, Anson Mount, Michael Eklund, RZA, Katie Nehra, Jaiden Kaine.